Playing with the irons is not a joke by any means. 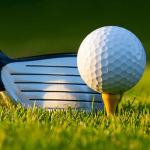 It requires a lot of skill to get the best results but one more thing that matters here is the best golf equipment. 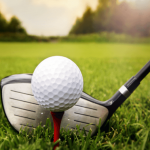 Yes, you need some good golf irons to stay at the top of your game and don’t take that for granted. Either, you game demands accuracy or forgiveness, you need to pick the best one. There are plenty of clubs in the market that claim to be the producer of most forgiving irons but in reality, they are not even close to it. Same, you can’t believe the taglines of various golf club brands stated as the maker best golf irons or most forgiving irons. 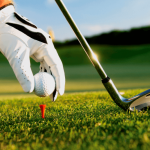 So, how can you select the best golf clubs for your game? All you need is to wait and just read our honest reviews and buying a guide on some of the best and most forgiving irons available in the market. 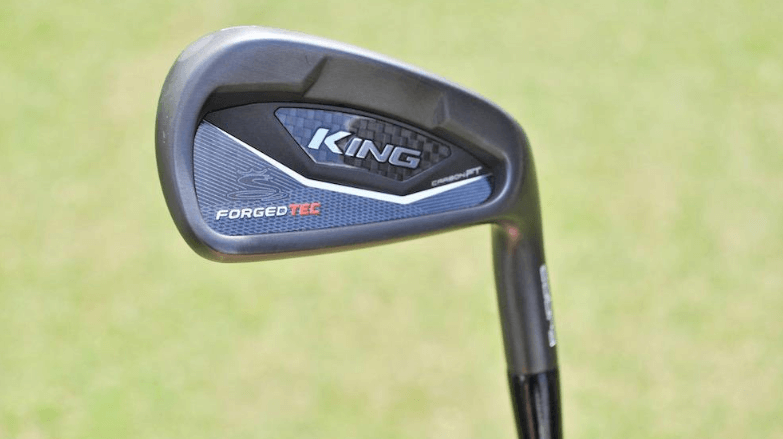 Here are some of the most forgiving irons with reviews. The primary goal of the engineers behind the Cleveland Launcher HB Irons is to provide maximum forgiveness and distance for the players. Yes, with the hybrid construction, Cleveland has gone through a nontraditional route to generate more forgiveness. Indeed, there is a lot to like about the Launcher HB Irons. The progressive shaping with high strength ultrathin face provides more flex at impact and delivers extra fast ball speed that every golfer would love to get. Apart from all these cool features, the best part about this club is the hollow construction that breeds the greater forgiveness, more control, and much better trajectory. The perimeter weighting in the head creates a high MOI which helps in stability and improves accuracy. 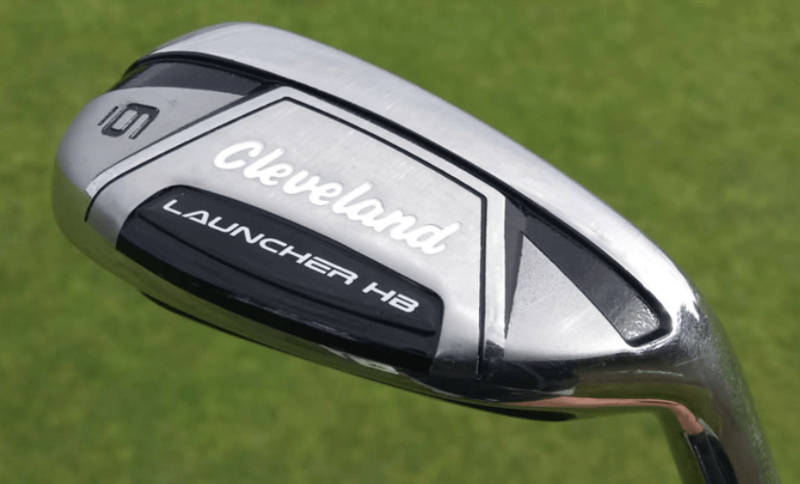 Well, there is no second opinion on the performance of the Cleveland Launcher HB Irons. Highly forgiving set with plenty of room to maneuver according to your gameplay. If you like hybrids more than irons, along with a lot of forgiveness then this one is only for you. Despite the hollow construction, the feel and sound of this club are quite good. So, apart from one of the most forgiving irons, it’s also a top super game improvement club as well. Dynamic Gold 98 Steel Shaft. Ladies, Regular & Stiff Shaft Flex. Easy to launch and get a higher ball flight. Highly forgiving with plenty of accuracy. Great stopping power around the greens. Beautiful appearance with a shiny finish and a black badge. Delivers straighter and high shots with minimal efforts. 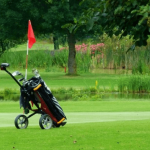 Turf interaction can be messy for some low handicap players. To top it off, Cleveland Launcher HB Irons are something beyond classy. Amazing in performance and very suitable for those who want greater forgiveness with high-grade consistency. Ping engineers have built the latest G700 Irons with just one aim in their mind and that is extreme forgiveness. Yes, this model is of the most forgiving irons in the Ping family as it offers unbelievable power and control to your shots. Ping opted for the hollow body construction with a face flexing steel face to ensure maximum forgiveness and distance. Moreover, a forgiving sole is also placed with a hydro pearl finish to reduce the friction and improve the turf play to a considerable level. Well, when you demand extra forgiveness and distance then you need to sacrifice some other critical attributes like consistency and control. But, in Ping G 700 irons you are free from all these worries because it allows you the combo of super forgiveness, long distance, and better accuracy. 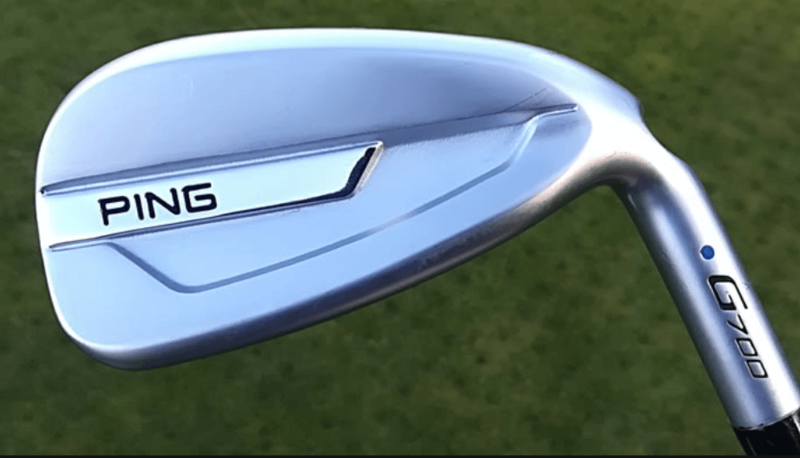 Look wise, the Ping G 700 irons are very sleek with a larger offset. Indeed, a chunky iron with stronger lofts and shiny features gives you a great appearance for sure. Golf Pride Tour Velvet Grip. Ping AWT 2,0 Shaft (Steel). Ping Alta GB Graphite Shaft. Better in accuracy and precision. Easy to interact with much-improved turf interaction. Feel is not that good as we were expecting. Overall, a sleek design, solid composition, and easy to hit irons. If you want extreme distance, then surely Ping G700 is made for you. To be very honest, I am a huge fan of Wilson Staff D300 irons because of its playability, forgiveness, distance, and appearance. Although it’s not the latest club still you can put it in the list of most forgiving irons in 2019. Wilson Staff D300 Irons comprises of FLX Face Technology that offers you full face upon impact which results in the powerful launch. Moreover, the urethane filled power holes provide great flex to the face and heel to toe weighting positioned in the head increases MOI, and yields ultimate forgiveness. The “D” in the D300 irons represent distance and this is what you will get in this club. .You can certainly place it in the list of most forgiving irons in the market. Apart from that, it’s super easy to play with these irons. Moreover, the playability is awesome with some serious accuracy. The wider sole helps you in getting more forgiveness through the turf whereas the feel of the D300 Irons is just above the next level. The appearance of this club is also something you can be proud of. A red batch with beautiful design and a shiny finish creates the WOW factors for most of the players. KBS Tour 80 Steel Shaft. Matrix Ruiz A-Type Graphite Shaft. Produces unbelievable forgiveness and distance. Ball flight is straight and penetrates the wind effectively. Super cool in appearance and look. Consistent irons with a lot of precision. It’s quite different from traditional irons. So, if you like traditional ones, then this is not for you. To be fair, distance, playability, and forgiveness is the name of the game of Wilson Staff D300 Irons. Arguably one of the top 5 most forgiving irons available in the market. In the list of most forgiving irons, if you are missing Cobra F Max club, then you are making a serious mistake for sure. Indeed, when it comes to forgiveness, F Max Irons is right at the top of the chart. The innovative ultralight technology is the main reason behind the ultimate forgiveness in the F Max Irons. 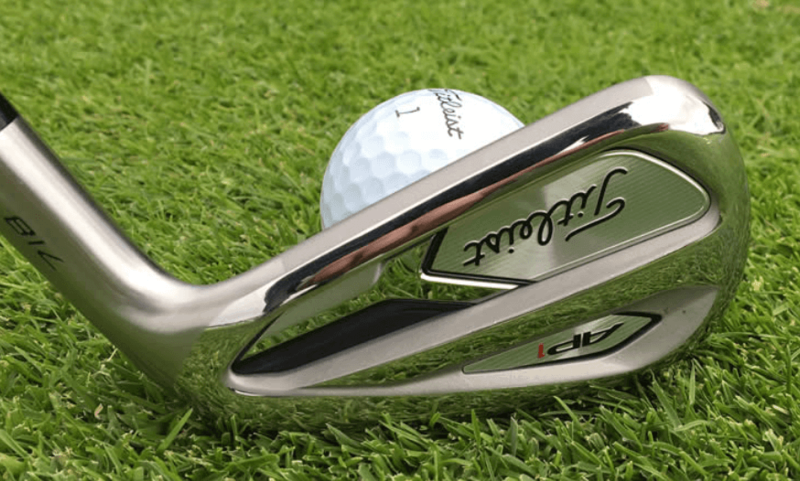 It is definitely a super game improvement irons that breed forgiveness and the ease to use. The super light shafts and heads yield incredible speed and distance effortlessly. Moreover, the undercut cavity creates more flex to face at impact while helps you in achieving greater distance and super fast ball speed. Well, for an average golfer, Cobra F Max is a pure treat. The ultralight club enables easy hitting, smooth swing, and better coordination. Other than that, the large Lamkin Rel grips also assist you in forming a better consistency and balance in your shots. So, it is a pretty well-balanced club that gives you plenty of forgiveness, consistency, and distance. Cobra Superlite 50 Men Shaft. Cobra Superlite 45 Women Shaft. Lamkin REL 360 Midsize Grip. Wonderful design and overall construction. Greater distance and fast ball speeds. Strong and fast swingers may struggle with the Cobra F Max Irons. 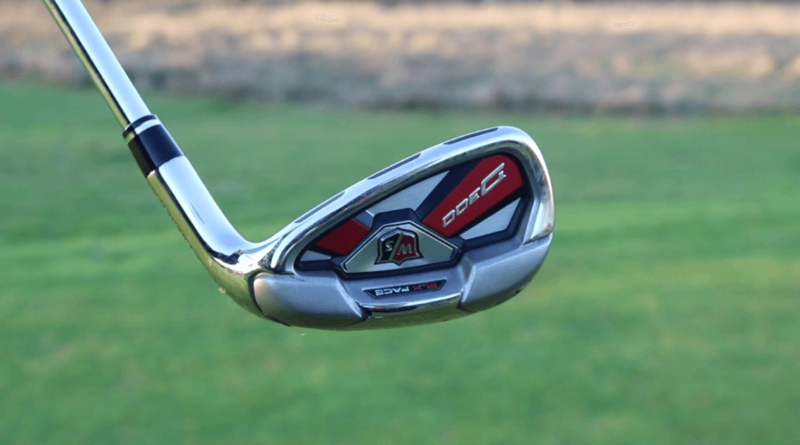 Cobra F Max is a beast in the super game improvement category. Highly forgiving, pretty easy to use and generates the maximum ball speed. So, a nice package for sure. Whenever you talk about the most forgiving irons, the TaylorMade M4 irons is surely in everyone’s list. 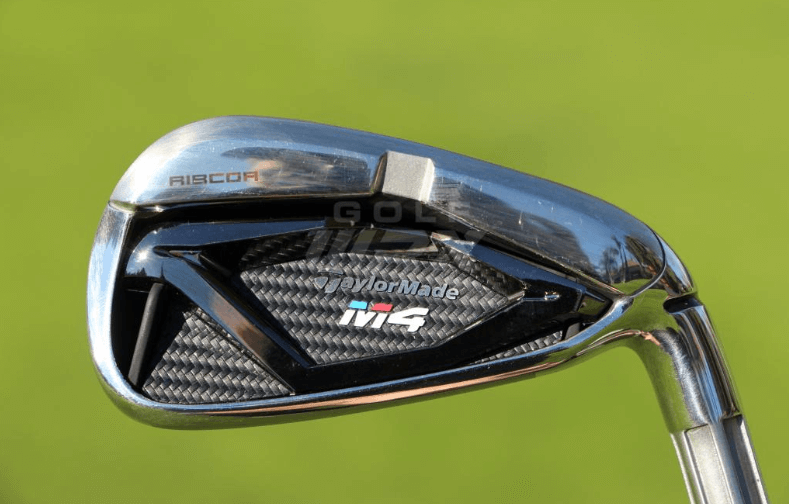 M4 irons set is a beast and certainly one of the very best golf irons right now in the market. The powerful RIBCOR frame transfers maximum energy in your shots which leads to higher launch and extra forgiveness. Moreover, the speed pocket technology and face slots are also optimized by the Taylormade engineers to produce the ultimate results. With the high MOI design and a perfect mass distribution system, you will always achieve much better ball speed and improved forgiveness. Well, if you need an iron set, that yields forgiveness, faster ball speed, accuracy and a lot of consistency then TaylorMade M4 is the way to go. The precise engineering with the combination of latest technologies have indeed covered all the aspects of the game and that’s why you get a power pack performance. KBS Max B5 Steel Shafts. Fujikura Atmos Red Graphite Shafts. Regular & Stiff Shaft Flex. Packed with the latest technologies. Super feel with a crunchy sound. One of the most forgiving irons. Easy to adapt and swing. Gapping issues for inconsistent strikers. Well, I have no single doubt in placing it as one of the most effective golf irons ever. A top-notch club from TaylorMade that gives an ultimate performance for every type of players. Callaway Rogue irons are composed of multiple latest technologies that transform your game into a whole new level with plenty of control and performance. The Callaway Rogue Irons are equipped with top-notch technologies to extract the best possible performance for the players. This club is laced with Face Cup and VFT technology that generates faster ball speed and more distance. In addition, the engineers added high-density Tungsten for better CG. To improve the feel and sound, Callaway filled urethane microspheres behind the face and that’s worked well for them. Arguably, one of the most forgiving irons you will pick in 2019. Callaway Rogue Irons offer you exceptional distance and steeper heights on your shots with immaculate stopping power as well. It also produces straighter and penetrating ball flight which helps you to achieve the target more often. The looks of Rogue Irons are also very good. Beautiful design with a decent head size, shiny chrome finish and attractive grayish black color scheme makes it a nice package. True Temper XP 95 Stepless Shaft. Extremely consistent irons with a lot of precision. Carries a fair bit of distance and steeper height. Some people complain that it tends to get scratchy from the finish after some time. So, the bottom-line is that Callaway Rogue Irons are love. If you want a club that is full of distance and forgiveness then take this club without thinking twice. Titleist 718 AP1 Irons are for those who want maximum distance and forgiveness. Without a doubt, it’s one of the most forgiving irons, Titleist has ever produced and that’s why this club is in our good book as well. In addition, there is also an unsupported ultrathin face place that generates explosive ball speed and much higher launch. There is not much option for you to doubt the performance of this club. Simply outstanding in workability, better in accuracy and greater forgiveness is what you can expect from 718 AP1 irons. Due to high MOI design, you get more speed from the shots hence it’s easier to hit the greens most of the times. Overall, it is a complete package with plenty of features in your bag. True Temper AMT Red Steel Shaft. Faceplate produces extra fast ball speed. Nice and cool looking club. 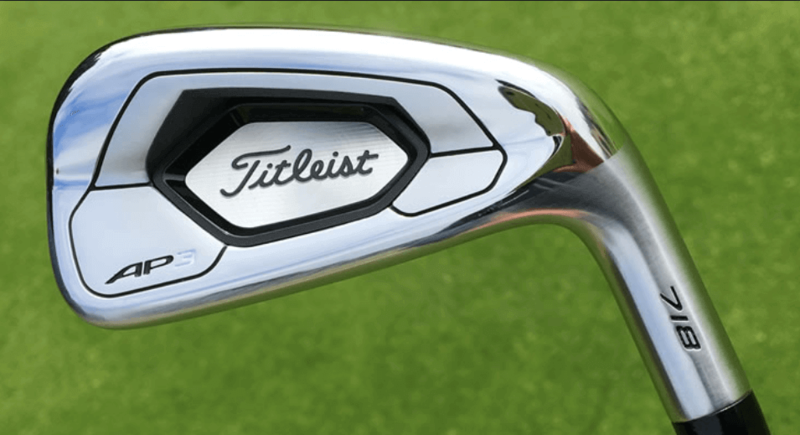 Well, we would highly recommend the Titleist 718 AP1 Irons because of its super cool features. 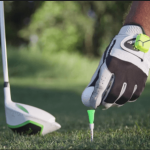 Surely, you will see a steep uplift in your game with this club. 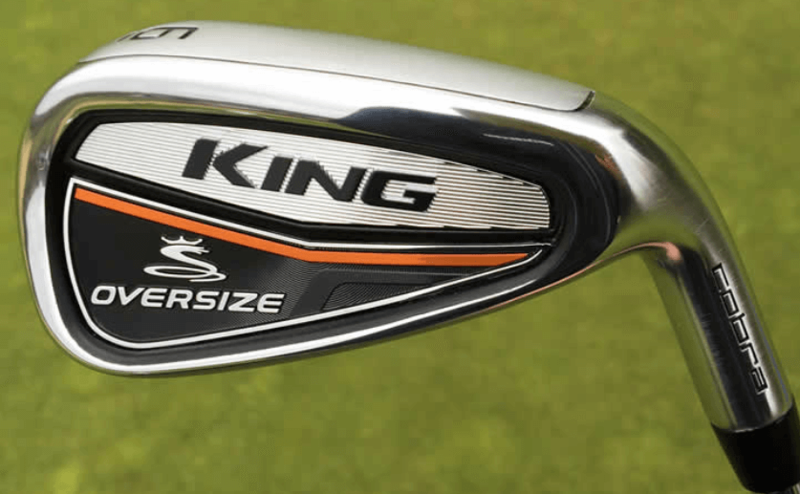 Cobra King Oversize Irons are purely made for next level forgiveness and higher ball speed. Certainly, Cobra engineers used the option of bigger size to attain the forgiveness and that has surely worked for them. The combination of the hollow body construction and PWRShell face generates extra fast ball speed and forgiveness which meet the demands of many golfers. Moreover, the installation of high-density tungsten weight towards the toe helps in maximizing the MOI which definitely puts a positive impact on your game. Well, it’s a fact that hollow bodies produce forgiveness as you get greater ball speeds and that’s why Cobra has gone for it in the Oversize Irons. Furthermore, the brilliant construction of this club enables you to get the higher trajectory from almost any lie and that’s sensational. The feel of these Oversize Irons is quite impressive. Overall, the playability and distance control is also up to the mark. True Temper XP 95 Steel Shaft. Light, Regular & Stiff Shaft Flex. You can expect better turf interaction. Not recommended for low handicappers. Lacks a touch around the greens for some testers. The final conclusion about the Cobra King Oversize Irons is quite good. With tons of forgiveness and impressive consistency, you can certainly pick this club on any day of the week. 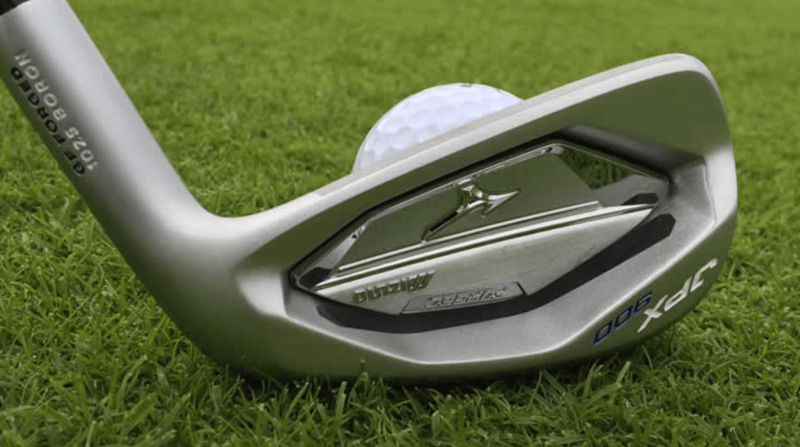 Mizuno JPX 900 Forged are indeed a standout club in the list of most forgiving irons. Not only the forgiveness but when you see the overall performance. It’s absolutely phenomenal for sure. The super sturdy 1025 Boron Steel composition with a speed pocket technology generates lightning ball speed without too much hassle. 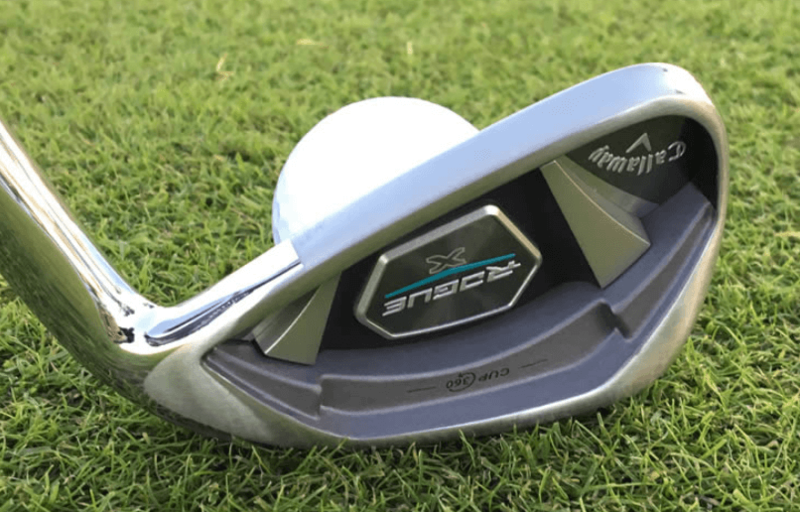 But, the real thing that makes the difference in this club is the multiple face thickness that saves 21.5 grams of weight. In addition to that, the sturdy Power Frame construction and the distribution of the weight around the edges increases MOI which produces great forgiveness in on and off hits. With the powerful frame and multiple face thickness, you can surely step up your game into a whole new level. 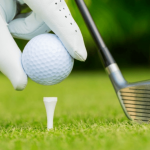 Apart from that, there are no issues regarding the forgiveness, consistency, and distance of the shots. A high number of your shots hits the green because you get the distance on your shots with the premium construction. So, yes with its performance, Mizuno JPX 900 is truly a winner club for you. True Temper Project X LZ Shaft. Extracts super high ball flight. Amazing stopping power around the greens. Great look, sound, and feel. Wonderful forgiveness and ball speed. Not ideal for high handicap players. Indeed, a fine golf club by Mizuno. One of the top-notch irons available with great value for your money. Highly recommended if you want to play with most forgiving irons. Titleist 718 AP3 Irons aim to deliver plenty of distance, super accuracy and greater forgiveness with its outstanding construction. Moreover, it is one of the longest irons you will ever see by Titleist brand. The hollow blade design with a speed pocket technology are the main reasons behind the epic performance of this club. Moreover, the undercut cavity with a thin face under the sole offers more distance and trajectory that helps your overall gameplay. In addition to that, the placement of high-density metal of 84 g weight in the heel and to maximize the MOI and offers more stability that breeds better results. Without a doubt, Titleist Ap1 and Ap2 irons are exceptional but this AP3 model is also a great model. Although AP3 Irons inclined towards the better players still you get a lot of forgiveness along with distance and workability. True Temper AMT Black Shaft. Left & Right Hand Availability. Yields extraordinary distance with a greater ball speed. Wonderful feel and classy in look. It’s not for beginner level players. Although this is a player distance club still the forgiveness is brilliant. Overall, the performance is sensational and puts great value on your money.